This is the story I've been looking for! Jasmine Guillory sets the tone for romantic comedies in the upcoming year. 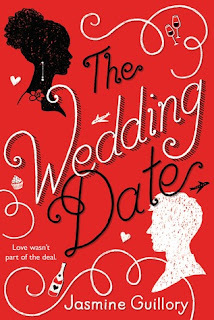 The Wedding Date takes readers from an impromptu meeting in a stuck elevator to a whirlwind romance across the state of California. Alexa Monroe finds herself accepting a date with gorgeous Drew Nichols after getting stuck in an elevator with him. She's going to be his buffer against the awkwardness of attending his ex-girlfriend and friend's wedding. With some trepidation on both sides, Alexa agrees to be Drew's fake girlfriend for the night. As it turns out, the two have an undeniable chemistry that extends well beyond the wedding. Their busy schedules don't keep them from spending the weekends with each other even though they live an hour from each other by flight. I'm not usually a fan of the fake date/fake girlfriend trope, but this setup was too intriguing to pass up. Drew has a type: tall, skinny, and blonde. Alexa is the complete opposite but her skin tone and curvy figure hardly matter to Drew as he's so attracted to her carefree laugh. I love that neither of them have a second thought about spending time with someone outside of their race. Even so, Guillory doesn't ignore the differences between their cultural backgrounds. Their relationship was not without its drama and setbacks, but Guillory keeps it realistic. The story moves at a steady clip giving you a chance to get to know the characters below the surface. The Wedding Date is a refreshing addition to the romance genre. You will love the fun and flirty vibe throughout the story and when it ends you'll be pining for more!